It’s actually 1 1/2 weeks!!! I can’t believe that we are about to leave Fishers and move this whole clan 15 hours south to hot, humid, sunny Orlando. The past few weeks have been spent saying goodbye to a lot of great friends, enjoying a number of “lasts” and wrestling with packing and getting rid of stuff. Today is the kid’s last day of school, then we have a week of packing in anticipation of the truck’s arrival on June 5th. A few days later and we will officially be moving out of our house and headed to our new adventure in Florida. We have had some kind friends put together some very humbling goodbye parties for us and we are grateful for their kind thoughts and words. It is hard to leave a place where we have loved so many, but it is comforting to know how much we are loved. We will miss our life here, but our lives are not our own. So on to the next leg of our journey here on Earth! 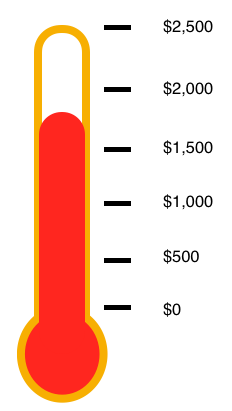 While we aren’t done yet, we have made some significant progress on our financial support. So far God has provided $1,860 of the $2,500 we need. We are so grateful for all that God has provided and all that our friends are investing in this ministry. So grateful. Please pray that God would continue to provide as we work in the coming months to close the gap and finish off our support raising. We told the kids that when we hit $2,500 they can each throw a pie in Mark’s face. So, they asked me to ask you to pray that God would raise it up quickly. And watch Facebook closely as that video will soon be making the rounds! This support raising process is so humbling. It is an excellent reminder that God is my provider and my complete trust must be in Him alone. We have been blown away by your generosity and God’s provision.